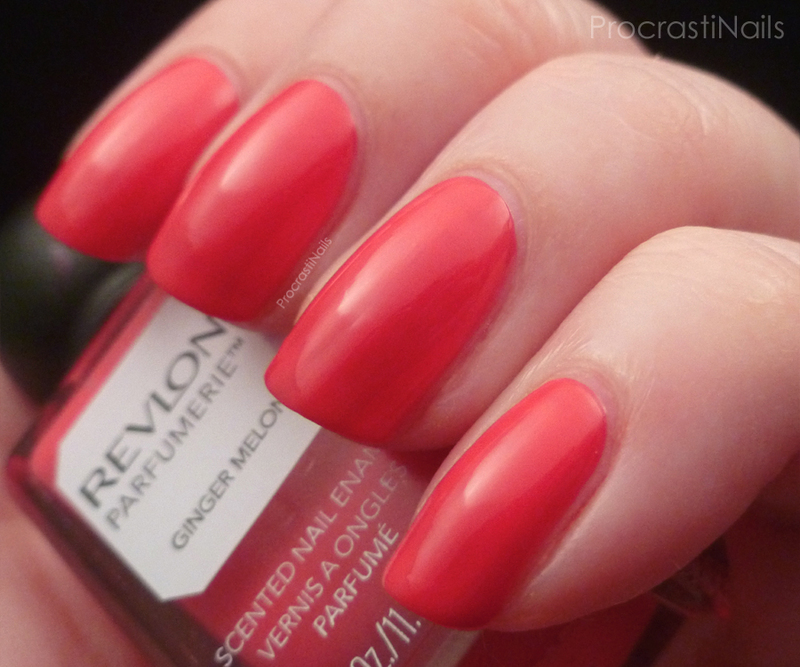 I have some of the Revlon Parfumerie swatches to share with you from the Spring 2014 Collection! I remember eyeing these when they first came out because I loved the light and bright shades, but in the end I never picked any of them up. Time goes by, and then suddenly while I'm running some errands at the pharmacy I see that the collection is on sale! Can I get a woohoo?! They were missing two of the shades (Lavender Soap and Orange Blossom) so I don't quite have the full set. But that's okay! My one complaint? Unfortunately, these aren't the polishes to go with if you have sensitive scent allergies (like moi). 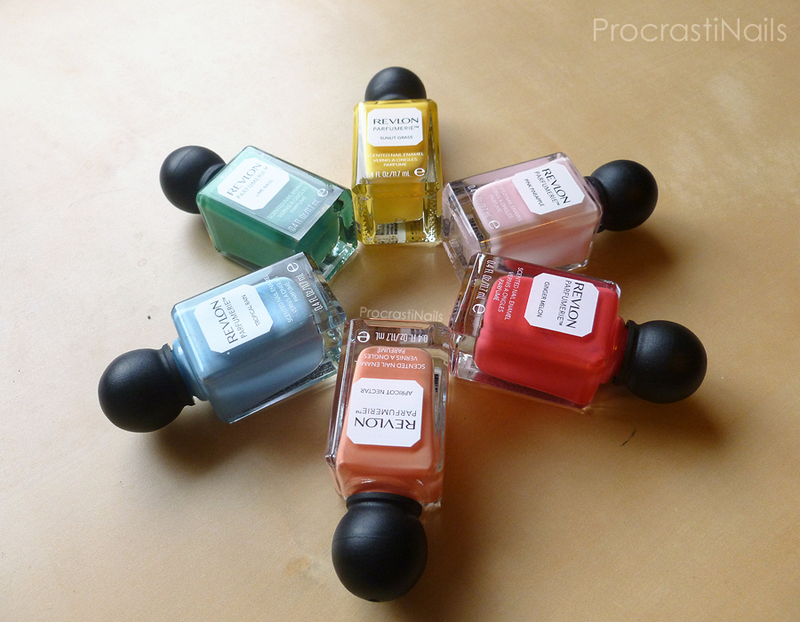 Which brings us to the second purpose of this post: I'm putting these polishes up in a giveaway! More info on that at the end of the post (so you can skip ahead if that's what you're here for), otherwise on to the swatches! 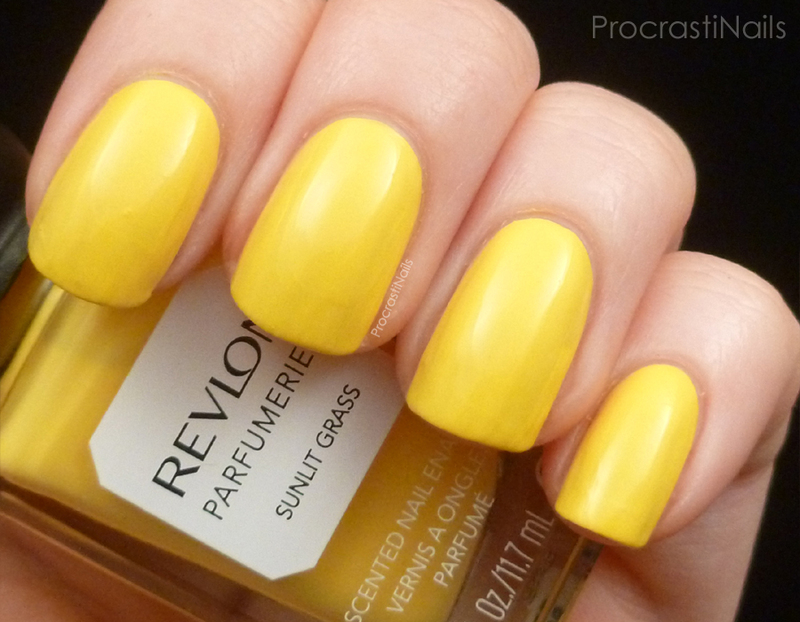 First up is Sunlit Grass which is a bright and cheery yellow. 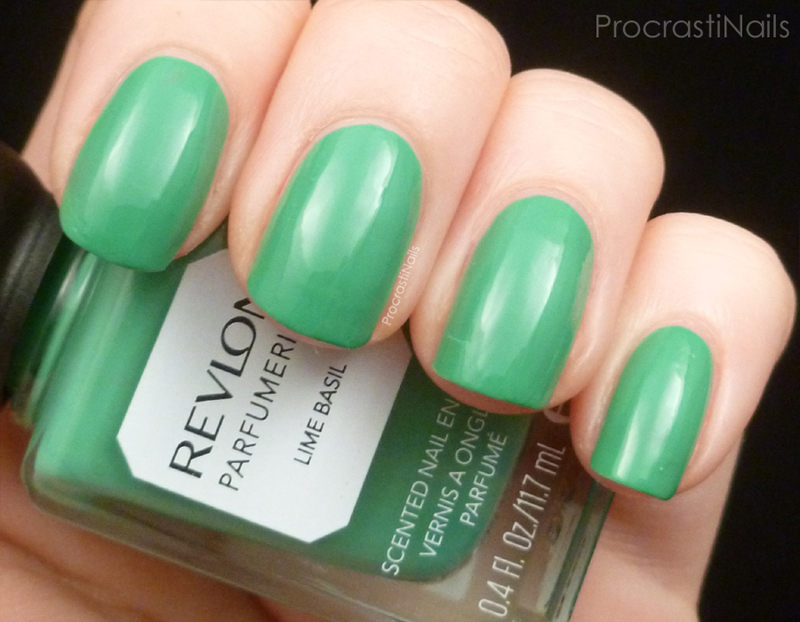 This polish smelled nice, but it was nothing like what I would imagine "sunlit grass" to smell like... Instead it had a fruity (almost melon-y) smell. Yellows aren't really my colour, and as you can see I had a bit of trouble with the application... I found it very streaky and thick, and if it wasn't for my policy of not using top coats on swatches I would have immediately applied a thick coat of Seche Vite to this one. This took 4 coats to build up to full coverage. Lime Basil smelled similar to what I expected - soft, earthy and tangy. But to be honest it also kind of reminded me of cleaning liquid. So. Yeah. It was a nice smell, but not necessarily one I would want to be getting whiffs of all day. 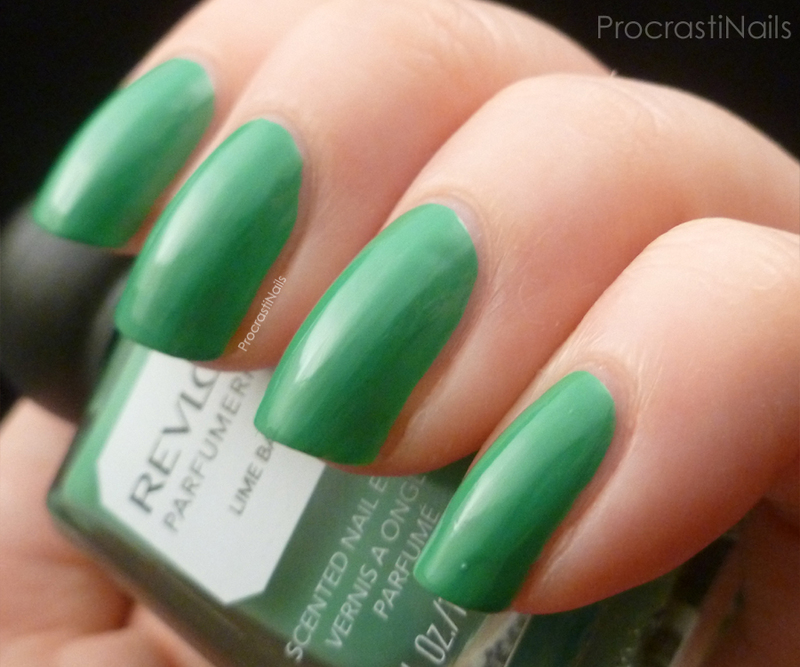 That being said the polish applied really well and I do like the soft jade colour. There's a wee bit of visible nail line in the right light, so where I used 2 coats you might want to use 3 just to be safe. It could have benefited from a top coat but it still turned out better than Sunlit Grass. 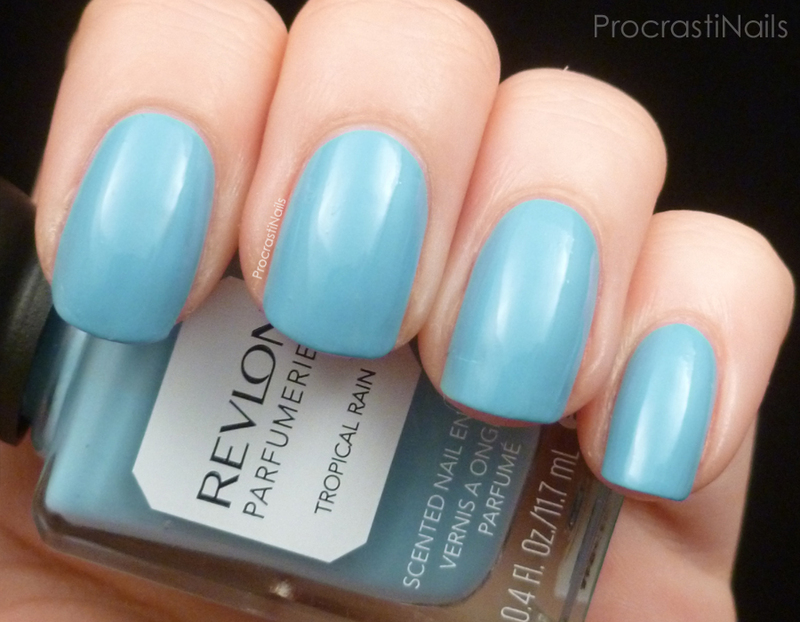 Tropical Rain is one of my favourite colours from this set, being a pale pastel blue. Love! This polish had a really good application and what you see here is 2 coats. The only way I can think of to describe the smell of this polish is "powdery." Not in a bad way, but the name made me think of bright and refreshing smells and this is definitely not that. Apricot Nectar had my favourite scent of the bunch, hands down. It was very light and fruity and sweet. 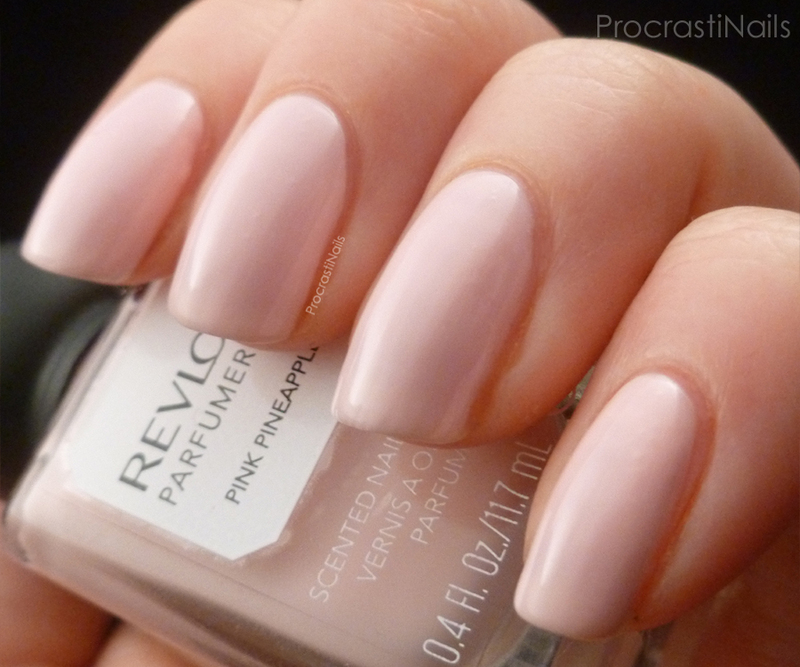 I like this shade, though I don't think it's the best for my skin tone. It needed 3 coats to reach full opacity which was fine, and as you can see the formula wasn't as streaky as some of the others. Win! Ohhhh Ginger Melon. You are the exact shade of pink that my camera hates, though I adjusted the colour balance in these pictures so this is pretty true to life. This polish was more of a crelly than the others and actually took 4 coats to build up to full opacity, but I really really love the colour. 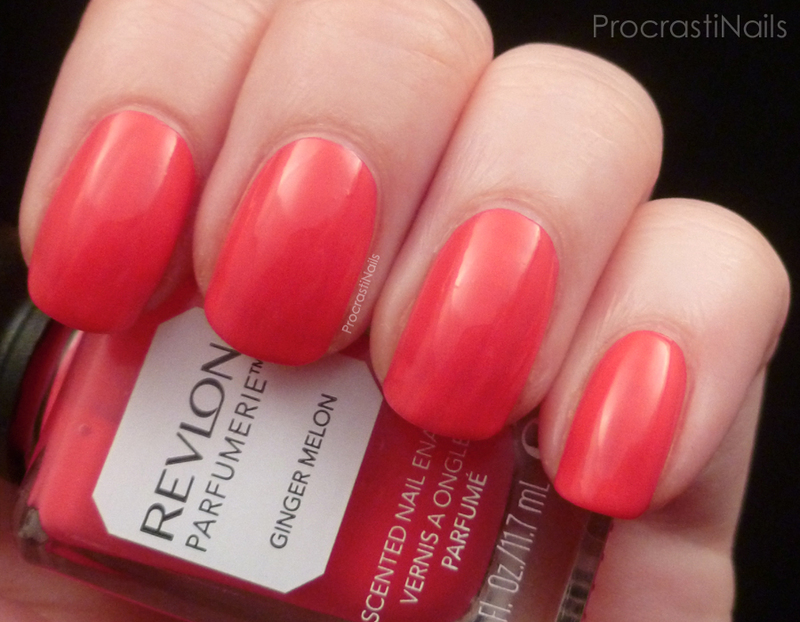 Perfect bright and bold pink for summer. This one also smelled really nice. My notes for it actually say "smells soooooo goooooood!" Haha. This is another fun and fruity one, kind of like fruit punch? The last polish from the set that I have to share is Pink Pineapple, which appropriately enough smells like a mix between pineapple and cotton candy. 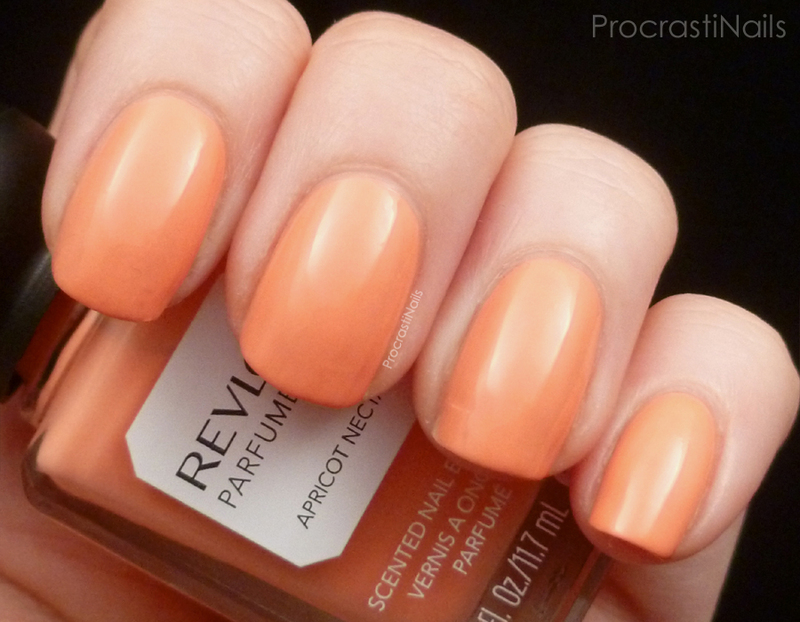 Fits the colour AND the shade! This one was a bit streaky to apply and took 3 coats, but as you can see below even with 3 coats there's still a bit of visible nail line. 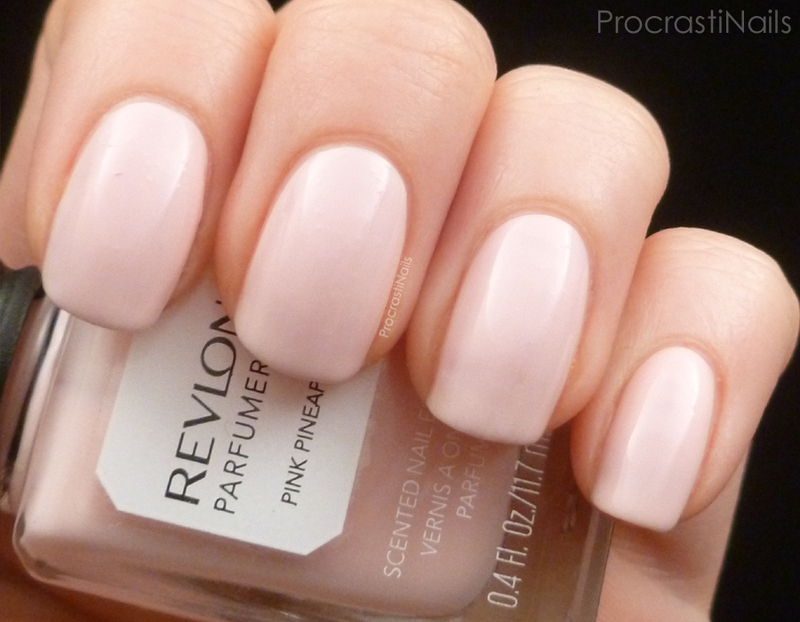 I'd say this is one to use undies or thicker coats with, but since it's a lovely creamy pastel pink I don't mind. If not for the fact it was scented (more on that in a minute) this would definitely be in my go-to pile for interviews or professional activities. Overall I think these are great polishes, and the packaging with these bottles is just too cute. As I mentioned a few of them were a bit streaky so I'd suggest using a top coat. And the good (and bad) news is that even with top coat the scent comes through! That's neat. Also re: the smells, it was funny but while I was swatching these I left my room for a bit and then came in and the WHOLE room smelled like a mixture of sweet and fruity polishes! 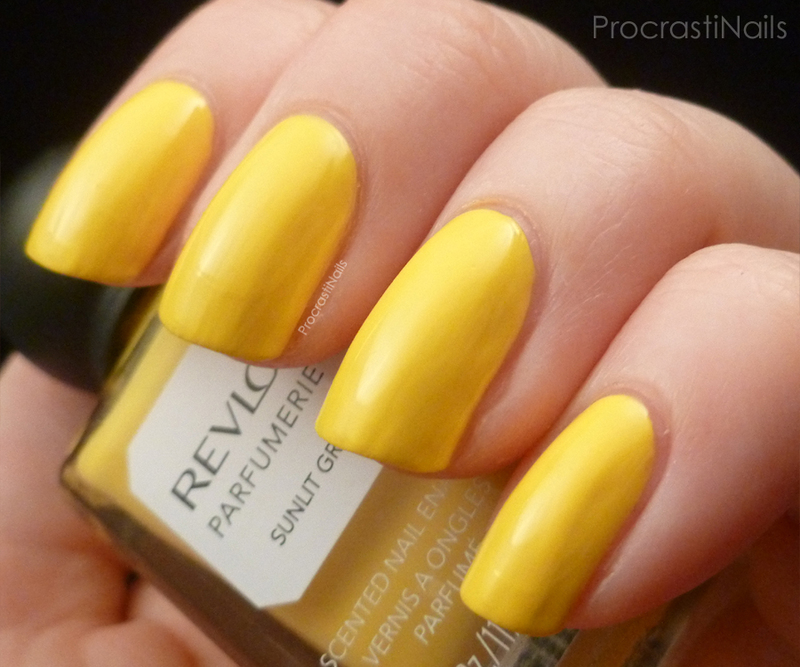 Six (6) Revlon Parfumerie Spring 2014 Polishes, as pictured in this post. Note: These polishes have all been used for one swatch mani, and three (Ginger Melon, Apricot Nectar and Sunlit Grass) were used for one nail art mani. There is barely any usage visible in the bottles. This giveaway will run for two weeks until June 8th, but since I'm currently away on vacation (I'm blogging from behind the vacation veil, ouuuuuuuuuu~~) and have this scheduled to go up after I leave I won't be able to deal with any potential issues that come up until after I get back at the beginning of June. Good luck to all the entrants! 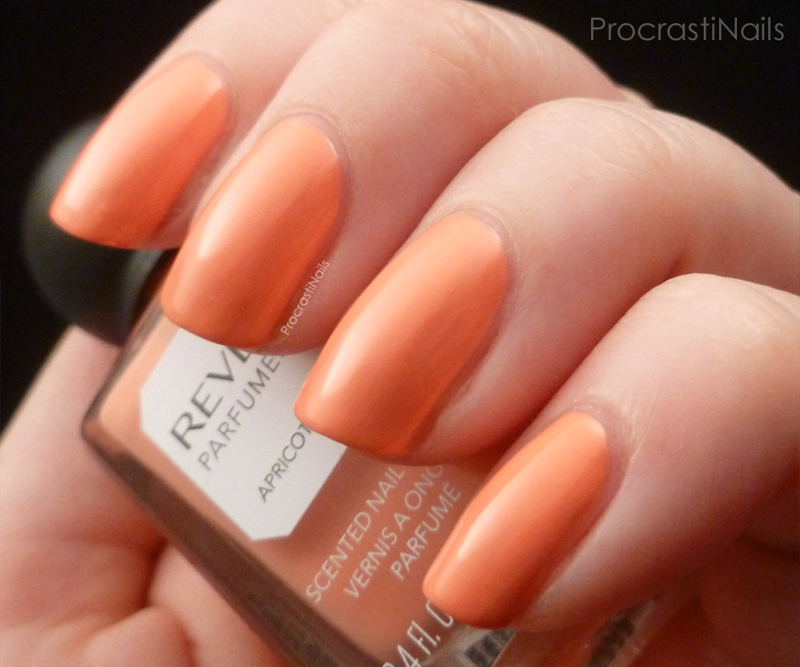 :) Let me know what you think of these shades, and if you've had similar issues with scented polishes. Shame that the scent is a deal breaker for you, I really love the one you sent me last year! Great review and swatches of them. There pretty colors too. Too bad to hear the scents are something you couldn't handle. Its so nice of you to do a giveaway on them. Holy Crap I LOVE your GoT nails!!!!!! Were the brushes easy to use with the odd rounded handle? I sometimes find that small handles are too difficult for me to use!